There's gold in them hills! At least that's the premise behind Hillbillies. The game where you help the friendly locals pan for gold. While they might seem a little backwards they are willing to share the wealth if you're willing to help out! Hillbillies is a 5 reel, 20 line slot game where you can bet from as little as one cent or as much as $100. While you're sifting for gold keep an eye out for the Hillbillies symbol which doubles as the wild and the scatter. To get started on your hill country adventure first set the amount you want to bet and the number of lines that you'd like to play. Wanna make a run to the hills and cash some prizes in the process? Play Hillbillies and Win Big! The Hillbillies is a fun game with lots of western stuff and makes for a great gaming adventure. The hillbillies search for gold in the hills and they are joined by their farmyard friends. When you are tired, you can enjoy a bottle of moonshine and that is sure to get you in high spirits again. Get those hillbillies in a line and you can have the greatest of times playing this western themed game. Hum with the banjo and the Hillbillies theme song or just enjoy the ambience of the gold rush, just don't forget – there's lots of money to be won. In the Hillbillies you may choose up to 20 lines to play and your bet is divided equally on the number of lines you choose. The wagering ranges from $0.01 to $5.00. You can adjust your bet by pressing the arrow buttons to increase and decrease the amount of your wager. The Auto-play option makes things easy for you. You can use the Auto-play option to let the computer make the spins for you. The game will progress nonstop until you stop the game manually or run out of money. In this slot the only three symbols that you need to pay a particular attention are the images of a grandpa, young women and the young man. These are symbols that will not only increase your odds of reeling in the winning combos but will also get you to the highest reward of 5000 coins. Plus it is even easier to get the scatter rewards using these three images as you don't need to follow a particular pattern to spin them on to the reels. If you want to practice before hand, keep in mind that you can play free slots with no restrictions at our instant play section. Payline: The term payline is used to denote the amount of lines across the screen on a slot machine. 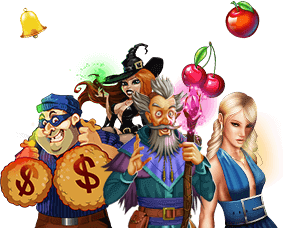 Free Spins: Free spins are the free games that can be won by satiating certain preset requirements. Will symbol: All the Hillbillies substitute any other symbol to make up winning combinations and hence are called wild symbols. Scatter symbol: Moonshine is actually a home-distilled alcohol. In the Hillbilly slots game, it is a scatter symbol that pays out 150 with five bottles and 3000 with all three Hillbillies showing.